A rash is a change of the human skin which affects its color, appearance, or texture. Japanese spotted fever is a condition characterized by a rash that has early macules, and later, in some patients, petechiae. Flinders Island, the largest island in the Furneaux Group, is a 1,367-square-kilometre (528 sq mi) island located in the Bass Strait, northeast of the island of Tasmania. Flinders Island is part of the state of Tasmania, Australia, and is situated 54 kilometres (34 mi) from Cape Portland and it is located on 40° south, a zone known as the Roaring Forties. The Weil–Felix test is an agglutination test for the diagnosis of rickettsial infections. It was first described in 1916. By virtue of its long history and of its simplicity, it has been one of the most widely employed tests for rickettsia on a global scale, despite being superseded in many settings by more sensitive and specific diagnostic tests. Rickettsia typhi is a species of infectious bacterium of the genus Rickettsia; it is the causative agent of Murine typhus. Queensland tick typhus is a condition caused by a bacterium Rickettsia australis. American tick bite fever is a condition that may be characterized by a rash of maculopapules. Rickettsia felis is a species of bacterium, the pathogen that causes cat-flea typhus in humans. In cats the disease is known as flea-borne spotted fever. 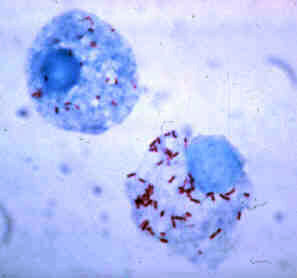 Rickettsia felis also is regarded as the causative organism of many cases of illnesses generally classed as fevers of unknown origin in humans in Africa. Rickettsia honei is a species of Rickettsia. Rickettsia japonica is a species of Rickettsia. It can cause Japanese spotted fever. Rickettsia massiliae is a tick-borne pathogenic spotted fever group Rickettsia species. Rickettsia monacensis is a tick-borne spotted fever group Rickettsia species. Pacific Coast tick fever is an infection caused by Rickettsia philipii. The disease is spread by the Pacific coast ticks. Symptoms may include an eschar. It is within a group known as spotted fever rickettsiosis together with Rickettsia parkeri rickettsiosis, Rocky Mountain spotted fever, and rickettsialpox. These infections can be difficult to tell apart. ↑ Rapini, Ronald P.; Bolognia, Jean L.; Jorizzo, Joseph L. (2007). Dermatology: 2-Volume Set. St. Louis: Mosby. p. 1130. ISBN 1-4160-2999-0. ↑ Unsworth NB, Stenos J, Graves SR, et al. (April 2007). "Flinders Island spotted fever rickettsioses caused by "marmionii" strain of Rickettsia honei, Eastern Australia". Emerging Infect. Dis. 13 (4): 566–73. doi:10.3201/eid1304.050087. PMC 2725950   . PMID 17553271. This dermatology article is a stub. You can help Wikipedia by expanding it.